Cenovus Energy pioneers use of amphibious excavators in world's largest caribou habitat restoration project - Great Excavations Inc.
A 20-tonne earthmoving machine that floats atop swampland with less impact than a person’s boots is helping Cenovus Energy restore habitat for threatened woodland caribou in northeast Alberta’s oilsands region. The company is pioneering the use of amphibious tracked hoes or excavators to restore boreal forest land impacted by oil and gas development. 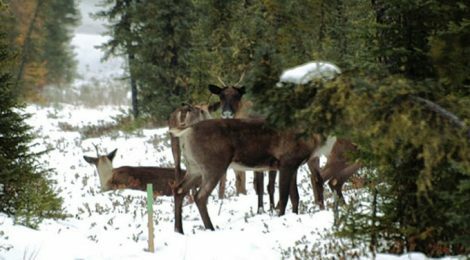 The amphibious vehicles are supporting Cenovus’s 10-year, $32-million Caribou Habitat Restoration Project, a voluntary initiative aimed at creating the world’s largest caribou habitat restoration project. “That’s a big challenge for us over the next 10 years. And we want to find ways to do that safely, efficiently, quickly and in a cost-effective fashion,” says Ted Johnson, Cenovus’s group lead for environmental solutions and systems.